4" - 60" Lengths Available: Browse Below! UV resistant black nylon cable ties are the ideal option for outdoor applications where your zip ties will be exposed to a higher than normal amount of ultra-violet rays from the sun. 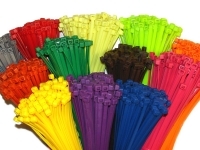 These black nylon cable ties are specifically manufactured to be used for continuous or extended exposure to the outdoors, weather, and UV light especially. 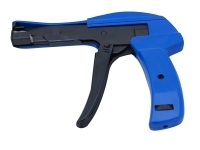 UV resistant cable ties are made by incorporating carbon stabilizers in the nylon resin during the molding process. 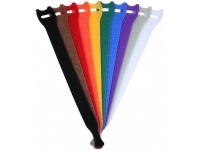 these black tie wraps provide greater resistance to the elements when compared to both our colored cable ties and our natural nylon cable ties, thus making them a cost effective and durable method for securing any bundle or item outdoors. 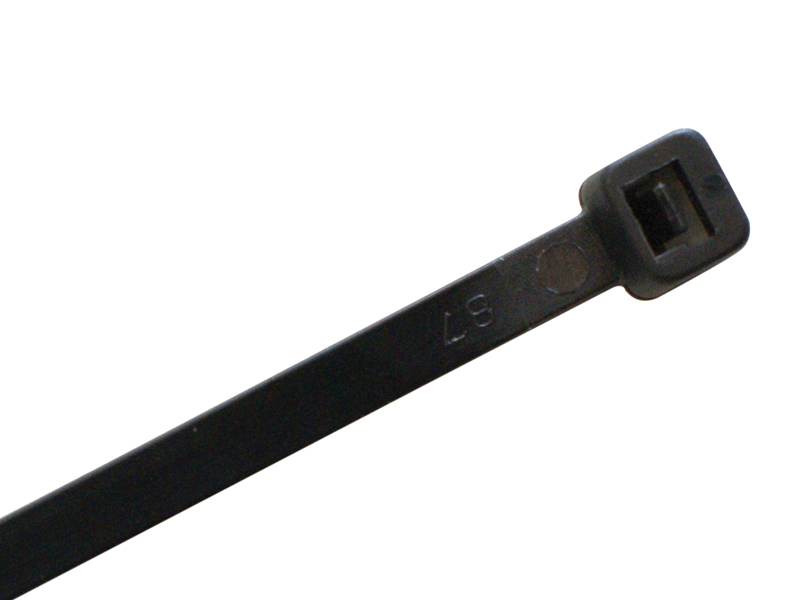 Our black cable ties are available from four - sixty inches in length along with varying tensile breaking strengths for each accompanying length. However, if you think our black uv zip ties still will not be durable or strong enough for your application please checkout our stainless steel cable ties that provide greater durability than any nylon zip tie. Further our Stainless steel ties are virtually incorruptible by outdoor exposure. CT242 4" Long 18 lbs 2.5 mm 1"
CT208 4" Long 18 lbs 2.5 mm 1"
CT-506-M 5.5" Long 18 lbs 2.5 mm 1.12"
CT259 8" Long 18 lbs 2.5 mm 2.16"
CT243 8" Long 40 lbs 3.5 mm 2.16"
CT266 8" Long 50 lbs 4.8 mm 2.16"
CT212 8" Long 50 lbs 4.8 mm 2.16"
CT209 8" Long 50 lbs 4.8 mm 2.16"
CT278 8" Long 120 lbs 7.6 mm 2.16"
CT102 9" Long 250 lbs 12.7 mm 2.3"
CT267 11" Long 50 lbs 4.8 mm 3.18"
CT219 11" Long 50 lbs 4.8 mm 3.18"
CT221 11" Long 50 lbs 4.8 mm 3.18"
CT277 11" Long 120 lbs 7.6 mm 3.18"
CT268 14" Long 50 lbs 4.8 mm 4.01"
CT255 14" Long 50 lbs 4.8 mm 4.01"
CT257 14" Long 50 lbs 4.8 mm 4.01"
CT274 14" Long 120 lbs 7.6 mm 4.01"
CT15BK 15" Long 250 lbs 12.7 mm 4.125"
CT7109 18" Long 120 lbs 7.6 mm 4.7"
CT19BK 19" Long 250 lbs 12.7 mm 5"
CT104 22" Long 250 lbs 12.7 mm 6"
CT-24-BK-100PK 24" Long 175 lbs 9 mm 6.64"
CT276 28" Long 175 lbs 9 mm 8.66"
CT275 32" Long 175 lbs 9 mm 9.68"
CT299 36" Long 50 lbs 4.8 mm 10.5"
CT297HV-50 36" Long 175 lbs 9 mm 10.5"
CT297HV-100 36" Long 175 lbs 9 mm 10.5"
CT40BK-50 40" Long 250 lbs 12.7 mm 11.7"
CT293 48" Long 175 lbs 9 mm 14.96"
CT298B 60" Long 175 lbs 9 mm 20"